Next time you'll throw your keys on the table just because your boss made you mad; remember that scratches on keys will eventually lock you out. Neglecting to keep keys intact and in good shape is a dangerous game. Ignoring the signals sent by your vulnerable security door locks is the same as putting your head in a lion's pit. Both locks and keys are mechanical and they will eventually erode, need treatments and lubrication and, at one time, you will be required to have both keys and locks replaced. Your locks and keys are affected by many things that will lead to their destruction, bad performance and necessarily to key and lock replacement. They are actually affected by the natural environment and locks can get very dirty. Humidity will have an impact on keys and depending on where they are kept in the house, they will eventually rust. Cold weather might also freeze the door locks and you will be having a hard time inserting the key. When you choose to put force instead of lock repair, it is evident that the key will gradually get distorted and eventually breaks. At the same time, keys are used every day and they are not usually treated well by their proprietors. They will surely get some scratches but remember that jaw distortions might cause a house lockout. Do you think this will be your only problem? Although being locked outside your house is one of the worse experiences, it will seem as a simple adventure compared with your inability to lock the door. Poorly maintained locks and damaged keys won't secure your home. One night you will try to lock the door before going to bed and you will find that the cylinder turns around, the key doesn't rotate in the lock or doesn't even get in. Wouldn't you agree that lock and key repair will make your life easier? 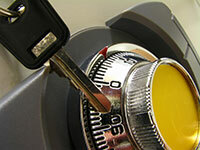 A few drops of lubricants in the lock and a second set of keys in the drawer will actually make your life more secure.